Situated in Naju, this hotel is within 16 mi (25 km) of Kimdaejoong Convention Center, Guus Hiddink Stadium, and 5-18 Memorial Park. Owen Memorial Hall and Missionary's House of Wilson are also within 16 mi (25 km). 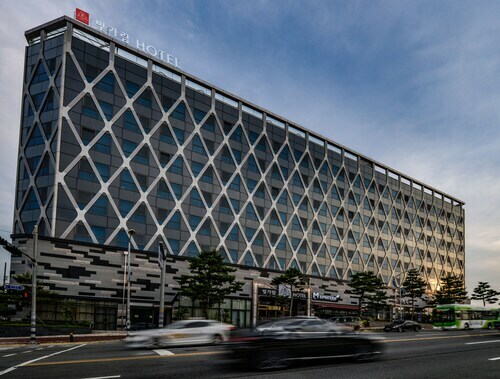 Situated in Naju, this hotel is 2.1 mi (3.4 km) from Naju Pear Museum and within 12 mi (20 km) of Yeongsangang River Culture Pavilion and 1913 Songjeong Station Market. Kimdaejoong Convention Center and Guus Hiddink Stadium are also within 16 mi (25 km). 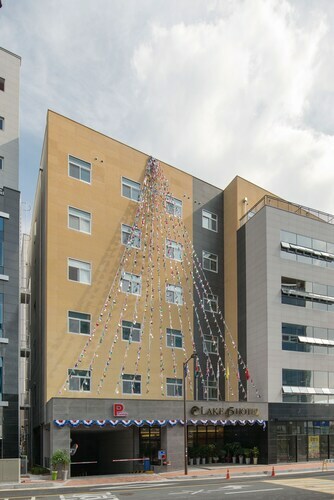 Situated in Naju, this hotel is close to Naju Pear Museum. Area attractions also include Yeongsangang River Culture Pavilion. Situated in Naju, this condo building is within 20 mi (32 km) of 1913 Songjeong Station Market, 5.18 Democracy Square, and Daein Market. National Asian Cultural Complex is 18 mi (29 km) away. How Much is a Hotel Room in Naju? 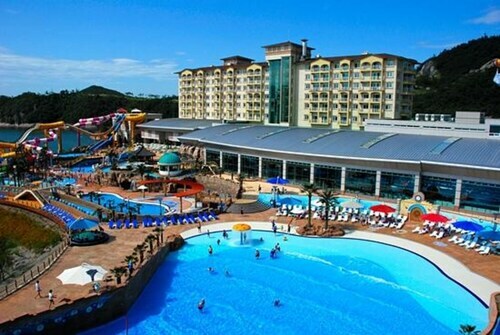 Hotels in Naju start at $40 per night. Prices and availability subject to change. Additional terms may apply. 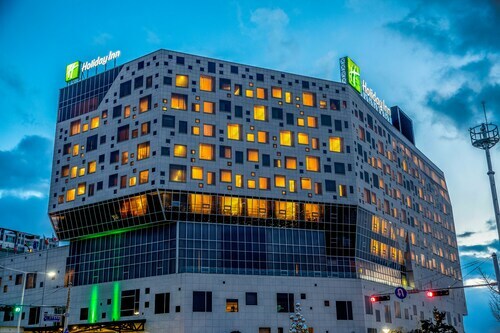 The Holiday Inn Gwangju, South Korea, which is the nearest Travelocity-listed hotel, sits 13 miles (21 kilometers) from the city center of Naju. Instead, why don't you consider the Ramada Plaza Gwangju, located in South Korea, which is 13 miles (22 kilometers) from the town center. Investigate the Prince Motel as well as the Hotel France. The Prince Motel is located only 14 miles (23 kilometers) away from the main part of Naju. The Hotel France, is 14 miles (22 kilometers) away. Other accommodation options in the surrounding area include the HAVANA HOTEL and the Nox Hotel. When you've got the time, you could visit other parts of South Jeolla. Spend time at South Jeolla's castles, traditional villages and old towns. Those drawn to nature should also put aside some time to enjoy the region's beaches, coastal plains and rivers. In this fascinating part of South Korea adventurous visitors can take up the chance to partake in mountain climbing and hiking. Looking for more things to do? You could spend a few hours visiting Yudal Mountain and Mokpo Modern History Museum, which can be found in Mokpo, 25 miles (37 kilometers) to the southwest of Naju. 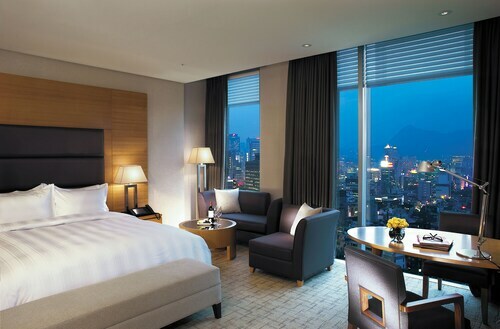 The F1 Hotel and Hotel New Evergreen are just some of the Travelocity-recommended hotel and apartment options in Mokpo. 18 miles (29 kilometers) to the northeast of Naju, you will find Buk-gu, home to the Geumsoojang Tourist Hotel and Palace Tourist Hotel. The Kumho Family Land and Uijae Museum of Korean Art are a couple of the popular points of interest to visit for those visiting Buk-gu. Gwangju International Airport is 12 miles (19 kilometers) away from central Naju. Enlightened visitors who desire to find accommodation nearby can find a night via Travelocity at the Noblesse Hotel or Manhattan Hotel. The hotel seemed a little weird at first, as it is very plain, and the room had absolutely no view (you could reach out and touch the next building through the window, almost) but it turned out to be extremely comfortable and a nice cool refuge from the August heat. It kind of grew on us. Spotlessly clean, quiet, great AC, comfortable bed, good location -close to stores, restaurants, subway, buses. An interesting Korean breakfast every morning. The staff was very nice: friendly, very helpful and accommodating; even though they didn't speak much English, I still felt they knew what I was asking and were happy to help. I would stay here again. 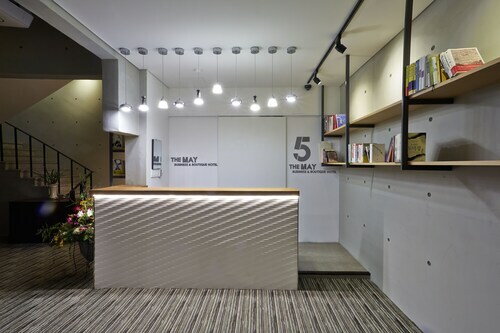 Stylish rooms, many with colorful view of pulsating Gwangju neon. Very professional and friendly service. Coffee shop a bit pricey but with nice offerings.